Norm-Referenced and Criterion-Referenced testing are two of many different types of testing methods that are employed to assess skills of a person. These tests are used to measure performance, but they are relative to different criteria. The scores are also reported in different formats as well as interpreted differently. Norm-referenced is a type of test that assesses the test taker’s ability and performance against other test takers. It could also include a group of test takers against another group of test takers. This is done to differentiate high and low achievers. The test’s content covers a broad area of topics that the test takers are expected to know and the difficulty of the content varies. This test must also be administered in a standardized format. Norm-referenced test helps determine the position of the test taker in a predefined population. Examples of norm-referenced tests include SATs, ACTs, etc. These tests do not have a pre-determined curriculum and the topics on the test vary depending on the panel that sets the test. Criterion-Reference is a type of test that assesses the test taker’s ability to understand a set curriculum. In this test, a curriculum is set in the beginning of the class, which is then explained by the instructor. At the end of the lesson, the test is used to determine how much did the test taker understand. This test is commonly used to measure the level of understanding of a test taker before and after an instruction is given. It can also be used to determine how good the instructor is at teaching the students. The test must have material that is covered in the class by the instructor. The teacher or the instructor sets the test according to the curriculum that was presented. Examples of Criterion-Reference tests include the tests that are given in schools and colleges in classes by a teacher. This helps the teacher determine if the student should pass the class. 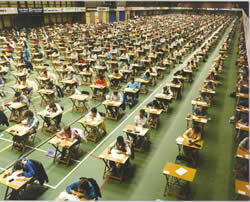 Norm-Referenced tests measure the performance of one group of test takers against another group of test takers. Criterion-Reference tests measure the performance of test takers against the criteria covered in the curriculum. To measure how much a test taker knows compared to another student. To measure how much the test taker known before and after the instruction is finished. Norm-Referenced tests measure broad skill areas taken from a variety of textbooks and syllabi. Criterion-Reference tests measure the skills the test taker has acquired on finishing a curriculum. Each skill is tested by less than four items. The items vary in difficulty. Each skill is tested by at least four items to obtain an adequate sample of the student. Norm-Referenced tests must be administered in a standardized format. Criterion-Reference tests need not be administered in a standardized format. Norm-Referenced test scores are reported in a percentile rank. Criterion-Reference test scores are reported in categories or percentage. In Norm-Referenced tests, if a test taker ranks 95%, it implies that he/she has performed better than 95% of the other test takers. In Criterion-Reference, the score determines how much of the curriculum is understood by the test taker. I have really enjoyed it. It has enlighten my understanding more. Thanks. Wow! well done, I got a concept ,thanx. Wow. Thanks so much, this is very simple and clear. Now I know what my lecturer was talking about. which of these two are competency based?